My polar marathon was an incredible experience and I am delighted to share it with friends who supported me so generously, as well as with the wonderful runners with whom I shared the experience. Please take a look at Blog page and Photo Gallery. Thanks to all who have helped me reach and surpass my target of £10,000 for two great charities. I am truly grateful, having raised over £14,500. 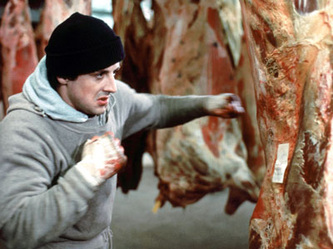 Training highlight below - training like Rocky in a meat freezer! See more photos. It was the coolest experience of my life – the Polar Circle Marathon! On 20 October this year, I ran 42.2km over the Polar Icecap in Greenland. This was my first marathon. With the generosity and support of many friends, I raised over £12,000 for two great charities - Cancer Research UK and Help for Heroes. Cold. Competitors in 2011 recorded -36C at the start. In 2012, it was an estimated -20C rising to -5C by the end of the race. It had snowed solidly for 24 hours before the race. Dry. One of the driest places on earth, so hydration is really important. Beautiful. The endless ice and snow of Greenland’s arctic desert, massive glaciers and northern lights. Why - you may ask? It was an opportunity to run on the World’s biggest ice cube. The Polar Icecap may not be around much longer. The biggest glacier is receding at 25m a day and I want to raise awareness of it. I supported two great charities and wanted to find a challenge that is worthy of asking for support. I get a massive kick out of shocking myself into a serious challenge. Finally, I just fell in love with the idea when I saw a picture of it in a magazine in January. How did I train for the race? This was the hard bit. Fitting in hours of running around work and family is always hard. I created time by watching less TV, getting up earlier, drinking (even) less and using time either late at night or early morning to get the miles in. Most of my training continues to be on the trails and in the Chiltern Hills, away from the roads. There were also some unusual training sessions such as the meat freezer at MeatMaster where I got to train 'Rocky-style' and punch carcasses! Dr Philip Watson at Loughborough University is doing research on extreme conditions and offered valuable advice on how my body would cope with the conditions. The event took place near Kangerlussuaq, a former Nato base and one of the most northerly airbases in the world. Around 100 people participated from 29 countries all over the world. The local Inuits provided logistical support as well as hot elderflower drinks during the race. The hotel is part of the airport terminal. The local food includes fish and musk ox (a type of hairy goat/bison). After the race, I visited Ilulissat, a small town on the edge of Disko Bay. The Kangia glacier flows at an average of 40m per day, throwing out vast icebergs into the fjord. I have been supporting two charities for whom I raised over £12,500 around the polar marathon. Help for Heroes – an amazing charity that has transformed the lives of the wounded service men and women. The press reports the deaths of soldiers but often overlooks the wounded who have sacrificed so much as well. Cancer Research UK – Cancer has touched almost every family in the country and through my professional work, I have seen some extraordinary scientific developments in the past few years. Scientists are closer than ever to developing cures for several forms of the disease and CRUK plays a pivotal role in supporting this. The chairmen of both these charities are both friends and professional connections and I am most grateful for their support. “As he undertakes the Polar Circle Marathon to raise funds for Cancer Research UK, I am full of admiration for David Mott. As the leading independent cancer research organisation outside North America, Cancer Research UK relies totally on the generosity of the British public to fund its work. Rarely has the outlook for cancer research been more exciting than it is today. sponsorship donations he raises from friends and supporters." you for doing your bit!" Greenland is the northernmost country in world. It represents 98% of the landmass of the Kingdom of Denmark. Unlike flat Denmark, Greenland's landscape is made up of towering peaks, glaciers and icebergs. It is also the largest island in the world with an area of 2.2m sq km and has 40,000km of coastline. But 1.8m sq km of this land mass lies beneath a sheet of ice of up to 3,000m thick - the weight of which has caused the interior of the island to sink into a concave basin with its lowest point now 360m below sea level. I believe this may be lower than the Dead Sea! The marathon takes place in Kangerlussuaq on the west coast and in they Arctic Circle. During the Second World War, the US set up a military base there named Blue West Eight that became an important way-station for bombers and cargo carriers. The base maintained its strategic importance during the Cold War when the Americans set up Distant Early Warning radar stations on the surrounding ice. The base closed in the early 90s and the settlement was renamed Kangerlussuaq. The name Kangerlusuaq means 'big fjord' in Greenlandic and stretches over 150km in-land from the sea. This gives the area a very stable and continental climate, one of the reasons for locating the air base here. The area only gets some 16mm of rainfall per annum which technically classifies it as a desert. When we arrived, the whole area was, perhaps unsurprisingly, brown and very barren. Nothing much grows here. In fact there are no trees in Greenland. The hills are covered by a tundra made up of a few whisps of grass, a type of dwarf willow shrub and various other low lying hardy shrubs. The rest is covered by the sandy deposits left by the glaciers. What really struck me was the sheer scale of the area. The hills, valleys, glaciers and are enormous. If you head East from Kangerlussuaq, you will need to cross the ice for 800km before reaching the coast. The distances are even greater further north.